What do you think of Christ? This is the most important question in the world. Happy for that sinner who can answer it from his heart and say, "Christ is precious to me " For certainly, he is a pardoned, justified, sanctified, saved soul. But he is justified IN the Lord by his everlasting righteousness. He is saved IN the Lord with an everlasting salvation. With a humble desire, and sincere aim to excite to this, the following work is intended. Dear reader, it is contrived for your pocket, and intended for your heart. I beseech you to accept it in love-to overlook the faults you find in it-and to look up for a blessing upon it, and the author of it. 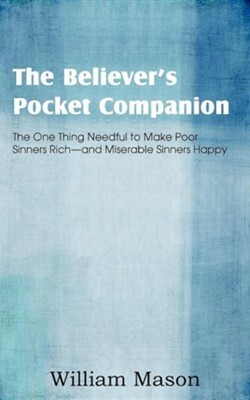 I'm the author/artist and I want to review The Believer's Pocket Companion, the One Thing Needful to Make Poor Sinners Rich and Miserable Sinners Happy.